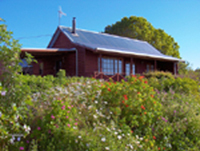 Self Contained Country Cottage Accommodation. Overlooking Stanley in NW Tasmania, Australia. Gateforth Cottages are the perfect getaway retreat to kick back, relax and enjoy the peace and quiet of the Tasmanian countryside. Soak up the tranquility of native bird song while you take in the cleanest air in the world and enjoy the heavenly panoramic views over lush farmland to the sea, Stanley and "The Nut". Stay a night or two and explore the best Tasmania has to offer in pristine natural rain forests, heritage tourist attractions and the cleanest, freshest air and food on the planet. After a day of exploring the beauty of NW Tasmania, relax in your cottage by the fireplace or enjoy the ambiance of the cottage gardens and the views of Stanley and the surrounding country side. Jean Moore is your host and extends a very warm welcome to Gateforth Cottages Self Contained Accommodation. We know you will enjoy your stay immensely and look forward to having you as our guest.